An innovative partnership in Africa's Sahel region integrates nutrition provision into the delivery platform of malaria prevention, with the aim of reducing child mortality during the rainy season. With fewer than 500 days remaining to achieve the Millennium Development Goals (MDGs), stakeholders in global health are working together to find ways to best align their efforts to achieve maximum impact and save the most lives. As global health leaders Dr. Paul Farmer and World Bank President Dr. Jim Kim noted in an article in the Lancet published in late 2013, “…the biggest obstacle facing global health is a failure of delivery.” They propose shared, integrated delivery of health services as the key strategy to revolutionizing global health. In the spirit of integration for greater impact, several organizations recently formed a non-traditional partnership aimed at integrating nutrition with a recommended malaria prevention intervention to reduce child mortality and improve nutritional outcomes during the hunger and rainy seasons. Seasonal malaria chemoprevention (SMC) is a World Health Organization-recommended malaria prevention program aimed at children under five, delivered through the administration of sulfadoxine-pyrimethamine plus amodiaquine (SPAQ). SMC has been shown to prevent 75% of all malaria episodes (including severe malaria cases) and decrease child mortality. It is estimated that 39 million children live in SMC-eligible areas in Africa; these children experience 33.7 million episodes of malaria and 152,000 childhood deaths from malaria each year – both of which can be partially prevented by SMC. The rainy season rollout of SMC coincides with the time when the prevalence of undernutrition reaches its peak in the Sahel region, known as the hunger season. As noted in a Médicins Sans Frontières publication, “Malnutrition and malaria combine in a vicious circle that has a huge impact on morbidity and mortality among the most vulnerable in the population”. Acutely malnourished children have weakened immune systems and are more than twice as likely to die from malaria as adequately nourished children. Children suffering from diseases such as malaria, diarrhea, and respiratory infections are also more likely to become malnourished. The timely bundling of nutrition interventions into planned SMC programs is crucial: in 2013, SMC program implementers expressed concern that the full benefits of providing SPAQ to young children may have been jeopardized due to the high levels of acute malnutrition present in the target population of young children. Additionally, provision of nutrition commodities are expected to improve community receptiveness to SMC. The impact of integrated delivery of nutrition commodities with SMC is being investigated in a four-month program in Kano State, Nigeria. Nigeria recently became one of ten nations in the Sahel to adopt and begin implementation of an SMC policy, and Kano State remains one of Nigeria’s most malnourished states, with nearly 10% of children suffering from acute malnutrition. Additionally, the whole of Nigeria has suffered from high rates of malaria transmission and resulting child mortality – In 2012 alone, malaria was responsible for 350,000 deaths in Nigeria. Kano State’s combined SMC eligibility and need for nutrition interventions make it a suitable candidate for the program, which will reach 2,000 children aged 6 to 24 months with SMC and nutrition commodities and commenced in time for the rainy season and hunger season at the beginning of August. This program hopes to generate evidence about the impact on nutritional growth (in terms of stunting and wasting) and malaria outcomes, and the operational feasibility of adding a nutrition intervention to SMC delivery. The Clinton Health Access Initiative (CHAI) serves as the implementing organization for the project, and will be responsible for monitoring and evaluating the pilot program. CHAI was instrumental in integrating the program’s novel nutrition element with existing SMC scale-up plans. Nutriset, a French-based manufacturer of nutrition commodities, donated the entire commodity supply for the pilot program, providing a lipid-based nutrient supplement (LNS) called Plumpy’DozTM, to provide lifesaving nutrition interventions to 2,000 children. Nutriset’s participation in the pilot program is part of the company’s ongoing dedication to research as well as to its humanitarian mission of working toward “nutritional autonomy for all”. UNICEF has provided technical assistance from its headquarters and from its country office in Nigeria. UNICEF’s expertise in working with a diversity of entities has been critical in mobilizing resources of the geographically distant partner organizations and uniting their efforts with those of the Nigerian government. The Children’s Investment Fund Foundation (CIFF), which provided funding for the pilot program, is a leader in providing catalytic investments to improve children’s health and education. Ensuring every mother and child has the right nutrients at the right time from pregnancy to the child’s second birthday, is a top priority for CIFF. The integration of SMC with nutrition programming aligns with the organization’s new nutrition strategy. The Government of Nigeria – particularly the Ministry of Health – has aided in advocating for SMC as part of an MDG4 achievement strategy, and scale-up of SMC is included in the Ministry’s Harmonized Plan of Priority Interventions for 2014 and 2015. The joint efforts of these organizations is a testament to how the formation of innovative partnerships within and beyond the global health community can enable improved health outcomes on multiple fronts. This partnership should serve as a model for global health delivery in the future – in which each partner brings their respective strengths to provide more equitable and impactful health services. Integrated delivery of SMC and nutrition provides an important opportunity to maximize a novel delivery platform in the service of MDG 4 progress. The importance of shared delivery platforms across different areas of health will ensure that children are more fully protected, and that health spending and personnel are used most effectively to achieve impact in 2015 and beyond. Success of the program will provide evidence for scale-up in other regions next year, adding to the number of lives saved necessary to meet MDG targets in time for the rapidly approaching 2015 deadline. Assuming 70% coverage across under-fives in all SMC-eligible areas, SMC is projected to save an additional 64,000 lives. With the integration of improved nutrition, it is hypothesized that additional deaths will be prevented due to treatment and prevention of undernutrition, which is the number one risk factor for under-five mortality due to malaria, pneumonia and diarrhea. While the initial integrated program was made possible through funding from CIFF and a commodity donation by Nutriset, it is anticipated that expanded integrated programs could be funded through leveraging existing and future funding for SMC delivery platforms. To date, ten African countries have adopted SMC implementation plans, and nutrition services could be easily integrated into this existing delivery structure, making the immediate scale-up of shared delivery of SMC and nutrition feasible. Such programming with enable partners from government, donor and implementing organizations to reach the most vulnerable children in these malaria and hunger endemic regions with the right set of preventative commodities and services – and at the right time of year. This opportunity should not be missed. Kim JY, Farmer P, and Porter ME. Redefining global health-care delivery. Lancet, Sep 2013. World Health Organization. Seasonal malaria chemoprovention with sulfadoxine-pyrimethamine plus amodiaquine in children: a field guide. Geneva, 2013. Cairns M, et al. Estimating the potential public health impact of seasonal malaria chemoprevention in African children. Nature Communications, 3:881. June 2012. Médecins Sans Frontières. 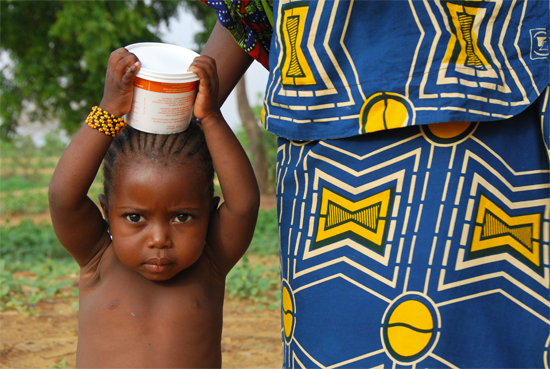 Niger 2013: Tackling the deadly combination of malaria and malnutrition. MSF Background Document. April 2013. Black RE, et al. Maternal and child undernutrition: global and regional exposures and health consequences. Lancet, 371:243-60. January 2008. UNICEF. Summary Findings of Cross-Sectional Health and Nutrition Survey, Nigeria, September 2013. World Health Organization. World Malaria Report. Geneva, 2013. Haddad L. Child growth = sustainable economic growth: why we should invest in nutrition. Children’s Investment Fund Foundation and Institute of Development Studies Policy Brief. May 2013. In 2014, UNITAID approved a $67 million grant to Malaria Consortium for SMC programming and market shaping efforts across 7 SMC-eligible countries. Additionally, The Global Fund will approve regional and country proposals for SMC, submitted for in 2014, for the 2015 – 2017 rainy seasons.